Column deal ( ): Deal the cards into columns, going top to bottom and left to right. 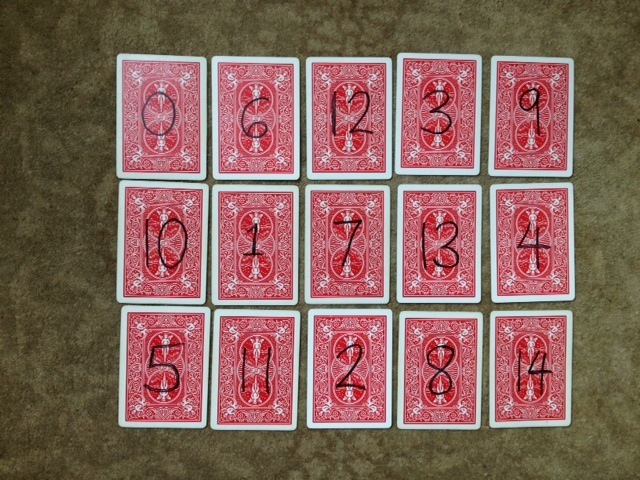 Diagonal deal ( ): Deal the cards diagonally down and to the right, wrapping around from bottom to top or right to left whenever necessary. There are corresponding actions which undo the above deals, which we will denote by Row pickup ( ), Column pickup ( ), and Diagonal pickup ( ). 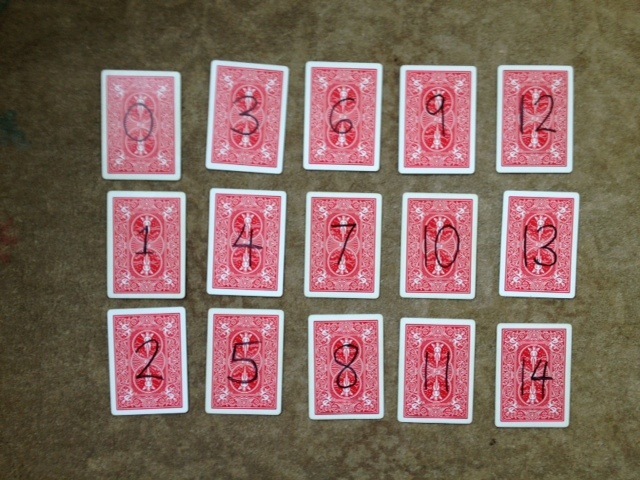 Note that in a pickup move each successive card is placed under the previous one. is a row pickup followed by a diagonal deal. is a column pickup followed by a diagonal deal. is a row pickup followed by a column deal. It is clear that , i.e., doing and then is the same as doing . Since the sign of a permutation is a homomorphism, we have . Believe it or not, this self-evident observation is the Law of Quadratic Reciprocity in disguise! Zolotarev’s Lemma: If is an odd prime and is a positive integer not divisible by , then , where denotes the Legendre symbol. Proof of Claim 1: By the above formulas we have and . It follows that is the product of the “column permutations” . But each is a composition of multiplication by modulo with the permutation , which always has sign since it’s either trivial or a product of cycles, each of length , and we’re assuming that is odd. Since is odd as well, we obtain the claim about , and the corresponding assertion for follows by symmetry. Let be a primitive root modulo , and write . Then the permutation of given by multiplication by modulo has the same sign as the permutation of given by modulo . The latter is a product of cycles, each of length , so If is even then is also even, and if is odd then since is odd and , must be even and hence is odd. Note also that is even if and only if is even. It follows that if and only if is even, which happens if and only if . 1) Zolotarev’s original paper can be downloaded here. 2) The supplement to the Law of Quadratic Reciprocity determining the Legendre symbol is also easily deduced from Zolotarev’s Lemma, which shows that is to the number of inversions of multiplication by 2 modulo . A pair with gets inverted if and only if and . Thus the number of inversions is , which by inspection is even if is congruent to 1 or 7 modulo 8 and odd otherwise. 3) If we identify the set with the set of integers modulo , the map is just the canonical ring isomorphism from to afforded by the Chinese Remainder Theorem. 4) An alternative, more algebraic argument, for Claim 2 is as follows. Since the bijection identifies the permutation of the array with the permutation of the totally ordered set , it suffices to compute the number of inversions of . Using the explicit formula we see that inversions of correspond to ordered pairs , with and , such that and . The latter two conditions together are easily seen to be equivalent to and . 5) A more group-theoretic proof of Zolotarev’s Lemma is as follows. We observe that is a surjective homomorphism from to ; surjectivity follows from the fact that if is a primitive root mod (i.e., a cyclic generator of ) then is a -cycle and thus has signature . The kernel of is therefore a subgroup of of index 2, but the only such subgroup is the group of quadratic residues. Thus coincides with the Legendre symbol . 6) Zolotarev’s Lemma generalizes to the statement that if are relatively prime odd positive integers then is equal to the Jacobi symbol , and the proof above then gives quadratic reciprocity for the Jacobi symbol (which is used for rapid computation of Legendre symbols). Note that in general is the sign of multiplication by on and not on , though when is prime these coincide. This entry was posted in Elementary number theory, Recreational math and tagged Quadratic reciprocity, Zolotarev's Lemma. Bookmark the permalink. I’m happy to see the growing popularity of Zolotarev’s proof! When I teach it, I use the following approach/notation (and this will appear in my Illustrated Theory of Numbers book eventually). 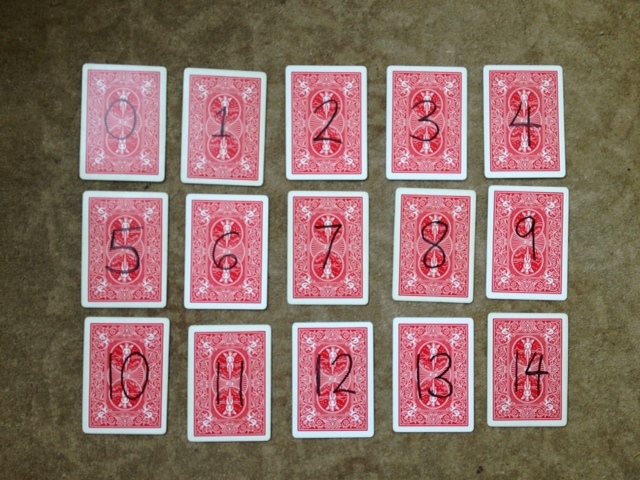 It’s not as magic-tricky as the card deal, but the notation is useful for other parts of teaching number theory. <a,b] to be the integer aq+b. (same comment as before). I find this approach works really well, especially if the notation [a,b] is introduced earlier in the context of the Chinese remainder theorem. Besides the notation, I think my usual approach is the same proof as yours (and Zolotarev’s). Uh oh – I think my plaintext math was interpreted as an HTML link. Sorry about that! You might guess that L sends [a,b] to \langle a,b] and R sends [a,b] to [a,b \rangle and F sends \langle a,b] to [a,b \rangle. Hi Marty — Yes that also seems like a good way to present the proof. Looking forward to your Illustrated Theory of Numbers book! Wait – surely the proof using class field theory is the “proof from the book”? I was pretty careful to say a proof from the book and not the proof from the book.